WASHINGTON, DC, March 30, 2010 (ENS) – Seventy-six organizations representing tens of millions of Americans today sent a letter to the U.S. Department of Agriculture asking that the agency immediately strengthen U.S. border protections to keep out cows from Canada with mad cow disease. The letter is in response to the disclosure this month of Canada’s 18th case of bovine spongiform encephalopathy, BSE, also known as mad cow disease, in a Canadian-born animal. The fatal disease in cattle causes a spongy degeneration of the brain and spinal cord. Humans can be infected by eating brain or spinal cord tissue of infected animals. The infectious agent is not a bacteria or virus but misfolded proteins known as prions. On February 25, 2010, the Canadian Food Inspection Agency confirmed the 18th case of BSE in a 72 month-old cow found dead on an Alberta farm. The case was detected through Canada’s national BSE surveillance program but was not made public on the CFIA website for two weeks. It was finally posted on March 10, hours after a press release was distributed by the advocacy group, Ranchers-Cattlemen Action Legal Fund, United Stockgrowers of America, known more simply as RCALF USA. USDA regulations permit live Canadian cattle born after March 1, 1999, to be imported into the United States without mandatory BSE testing. This means that the infected cow would have been eligible for import into the U.S. cattle market had it been alive. The dead cow was the 11th case of BSE in a Canadian cow that met USDA’s age requirements to enter the United States. The letter says regulations in Europe and Japan are stricter, so U.S. beef consumers are at greater risk than consumers in those countries. R-CALF USA and the other groups who signed the letter fear that USDA’s relaxed import standards are putting not only U.S. beef consumers at risk, but also the U.S. cattle herd and the livelihoods of independent U.S. cattle producers. USDA first relaxed U.S. safeguards against BSE in 2005, and then further relaxed those safeguards in 2007 with its over-30-month rule (OTM Rule), which facilitates the importation of Canadian cattle born after March, 1, 1999, and beef from Canadian cattle of any age. The cut-off age of 30 months was set because below this age the BSE risk is “exceedingly low,” said the agency. At that time, Canada had detected only three BSE-positive animals born after March 1, 1999, but as of March 10, 2010, Canada has detected 11 BSE-positive animals born after that date – all of which met USDA’s age requirement for export to the United States. “We are asking the administration to immediately reverse this reckless and unscientific approach to the dangers of BSE by withdrawing the OTM Rule that basically eliminated the United States’ only defense against the introduction of BSE into the United States – its import restrictions that prohibited the importation of cattle old enough to have been exposed to the disease,” said R-CALF USA CEO Bill Bullard. “Unfortunately, USDA, it seems, has decided that measures other than border restrictions are adequate to protect against this always fatal disease, yet we cite page after page after page of various violations over the past several years – in both U.S. slaughter facilities and U.S. feed production facilities – that continue to put the general public at risk and our U.S. cattle herd at risk,” Bullard pointed out. Scientists have concluded that mad cow disease is spread when cattle, who are normally herbivores, are fed the remains of other cattle in the form of meat and bone meal. Between 460,000 and 482,000 BSE-infected animals had entered the human food chain before controls on high-risk feed were introduced in 1989. 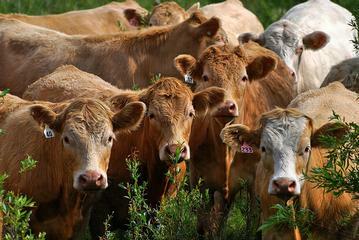 Although the feed controls are supposed to eliminate high-risk parts from entering the animal and human food chains, the letter lists 13 recall incidents over the past five years involving more than 144.5 million pounds of beef that violated the USDA’s regulations for preventing mad cow disease. Carcasses were sold with high-risk parts such as spinal columns or tonsils attached. R-CALF USA warns that this evidence undercuts USDA’s assumption that BSE risk pathways to humans have been effectively eliminated. In addition, a feed manufacturing firm was cited this year by the FDA for manufacturing and distributing adulterated animal feed to nine states: Idaho, Nevada, Utah, Wyoming, Colorado, Montana, Washington, California, and Oregon; yet nowhere was specified exactly how long this manufacturer had been distributing the adulterated feed. “These were just the incidents that were caught and likely represent only a fraction of the cattle that were processed without complying fully with required BSE mitigation measures. Thus, there likely are hundreds of thousands of U.S. consumers who have purchased beef that likely was not subject to U.S. mitigation measures,” the letter states. “This ongoing, potential human exposure to BSE is unnecessary and can and should immediately be avoided by prohibiting the introduction of cattle and beef from Canada where the BSE agent is known to have recycled in that country’s feed system through at least all or part of 2004, and where it likely continued to recycle at least until Canada implemented its upgraded feed ban in mid-2007,” the groups wrote.